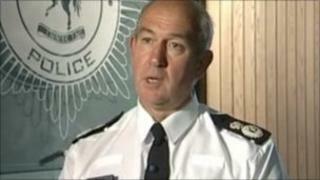 The chief constable of Kent Police has questioned the phasing of government cuts to his force's budget. Ian Learmonth has to make £53m worth of savings by 2015 with the deepest cuts in the first two years. Cuts are due to start with 6% reductions in 2011-12, 8% the year after, and 4% the following two years. Mr Learmonth said his force faced upcoming challenges including making a contribution to the policing of the London Olympics in 2012. "To take the majority of the budget savings in the first two years will just add to those challenges," Mr Learmonth told BBC Radio Kent. "I recognise the challenges the country has in addressing the huge financial problems, but it would certainly help us and make it a much easier route over the next four years. "We know we have got to make our contribution, we know we have got to do things differently, we know that there are some savings to be had around efficiencies. "But if you are taking 20% out of a budget, which for us means £53m, that is a huge hit on the way we do our business." Mr Learmonth appeared to agree with Ann Barnes, who chairs Kent Police Authority. She has written to Policing Minister Nick Herbert, calling on him to look again at the timing of the cuts. Mrs Barnes said the cuts were "extremely front loaded" with the bulk coming in the first two years. In a letter to Mr Herbert, she said: "I do appreciate that all new governments wish to move forward at a pace, but if nothing else, please can some thought be given to the timing of all these changes. "There is just too much going on at the same time and public safety is not something we should take risks with." In a statement, the Home Office said the country was "battling a record deficit" and the police must play their part.